While small business professionals commonly wear many hats at the same time, a certified bookkeeper (CB) must do so while staying on top of regulatory guidelines. The way a business records and reports its financial activities may need to change as rules are rolled back or newly issued by government authorities. But a small business may not have the resources to hire an entire accounting firm to oversee such duties, which can include keeping track of payroll, billing and other transactions. That's where a certified bookkeeper comes into play. Many small businesses tend to use bookkeepers as their sole financial officer who keeps watch on their accounts, according to the American Institute of Professional Bookkeepers (AIPB). Certified bookkeepers may be tasked with performing duties that require substantial financial expertise and training. 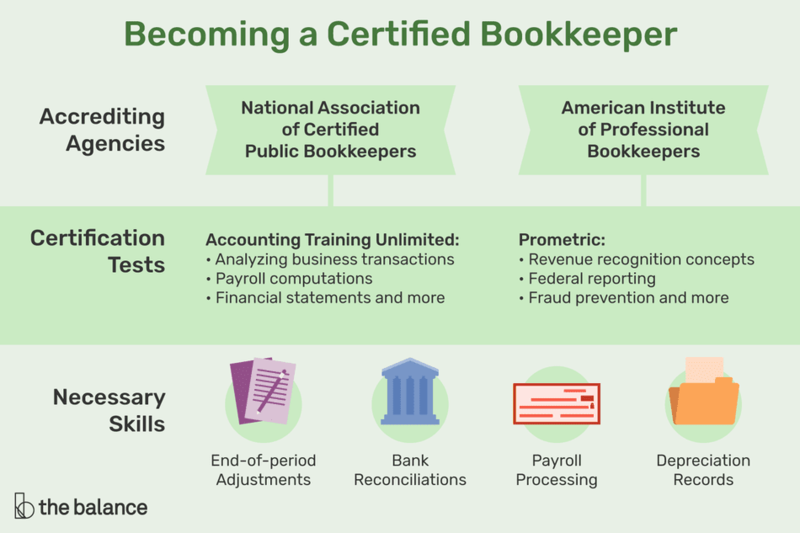 A professional who earns the certified bookkeeper designation is expected to possess the knowledge and skills necessary to perform the essential accounting functions that a small business requires. That can include showing you know how to prepare end-of-period adjustments, can conduct monthly bank reconciliations, process payroll, and record depreciation for both book and tax purposes. The NACPB and the NBA are part of a company called Accounting Training Unlimited which provides online training, testing and professional certifications. The uniform bookkeeper certification test administered by this company is an open book, multiple-choice exam that covers topics such as analyzing business transactions, payroll computations, and financial statements. This exam consists of 50 multiple choice questions. Candidates must score 37 out of 50 or 75% in order to pass. The AIPB has its own exam including questions about why accruals, deferrals and other adjustments are made. The exam is given in four parts — the final two are open-book. You must also understand revenue recognition concepts, depreciation expense for tax and book, and payroll concepts. You should be prepared to complete federal reporting forms, required payroll data, Form W-4 and state withholding forms. The exam tests your knowledge of internal controls and fraud prevention. The institute offers study materials for content that may appear on the exam — available through its website for a small fee. Beyond the exam, the AIPB requires candidates for its bookkeeper certification to have a minimum of two years of related experience either before or after completing the exam. Applicants for either test must also agree to abide by codes of ethics. In order to pass the AIPB exam, bookkeepers must receive a minimum score of 75% on the first two parts and 70% on the second two parts. The uniform bookkeeper certification test offered through Accounting Training Unlimited can be taken on any computer with internet access. The applicant must schedule a date and time for the exam and will be given access to the test via email. The test must be completed within a year after the email is sent. The cost to take the test for the first time is $100 for members and $150 for nonmembers. Applicants who do not pass and wish to retake the test must pay another fee — $50 for members and $75 for nonmembers. The AIPB test can be scheduled to be taken at any of the testing centers operated by a test administration company called Prometric. The cost of certification for members of AIPB is $479. Nonmembers must pay $574 for their certification. After attaining certification, ongoing training is required. At least 24 hours of annual training is mandated for the bookkeeper certification available through Accounting Training Unlimited. These can be completed through webinars, online portals and via self-study courses. AIPB requires bookkeepers to complete 60 hours of continuing education courses every three years in order to maintain their registration. Just like the ATU requirements, these can be done online or through self-study. Bookkeepers who earn their certification may have a number of advantages over their peers who have not done so. You can use the "CB" designation with your name to show your professional status. This can alert companies and potential clients to the skills you possess which may improve the chances they will retain your services. You can increase your market value. Certified bookkeepers tend to receive higher salaries than peers who lack a nationally recognized accounting or bookkeeping certification. Your importance to the company or clients may increase. The knowledge and expertise that come with earning certification will better prepare you to handle accounting, bookkeeping and tax issues small business owners face. Giving the responsibility to you lets them tend to their business. A small business owner should be able to concentrate on running their business without the burden of balancing the books. It will cut back on costs. While you may charge for your services, the monthly fees a small business owner will pay will likely be much lower than if they were to hand you or a tax filer/accountant a stack of paperwork to sort through at the end of the year. As a certified expert, you can point the small business owner in the right direction if you see opportunities or missteps.